1. Cut the aubergine into 1-2cm thick rounds. Soak the slices in the milk, covered and chilled, for 30-60 minutes. 2. Mix the breadcrumbs with the fennel, nigella seeds and seasoning in a large bowl. Remove the aubergine from the milk and dip the slices first in the beaten egg and then in the panko crumbs. Set aside on a tray. 3. Fill a large saucepan or fryer no more than one-third full of oil. Warm to 190°C or until a cube of bread sizzles and turns golden in 20 seconds. Deep fry the aubergine in batches, for 2-3 minutes, turning if necessary, until golden and crunchy. Place on kitchen paper to remove any excess oil. Keep warm. 4. 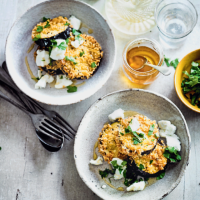 Crumble the goats’ cheese into 4 shallow bowls, arrange the aubergine slices over the top, drizzle with honey, scatter over the parsley, season and add a squeeze of lemon. Then serve immediately.